Hey everyone! It's that time!!! We've been putting the finishing touches on our latest update, and we're in the middle of the submission and release process as we speak. 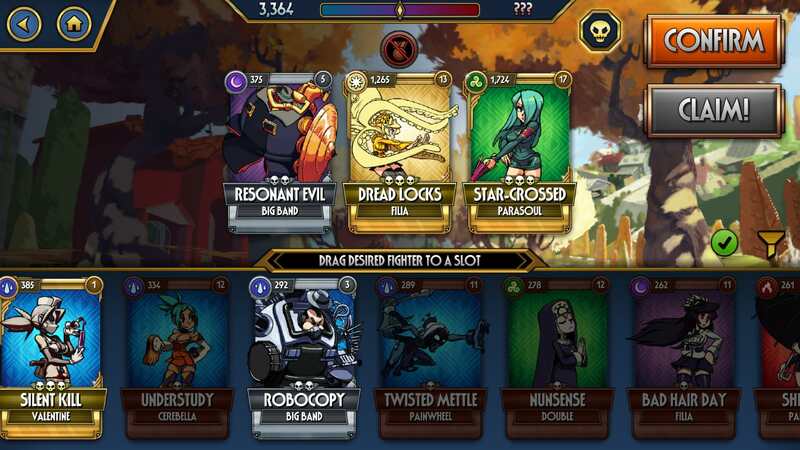 Give players more control over setting their own Defense Team so they could build interesting and challenging defense teams while using Prize Fight modifiers to their advantage. Reward players for building clever defense teams by granting them Prize Fight points they can collect throughout the day, even if they don't have time to play. Give players more reasons to invest in powerful "defensive" characters like Dread Locks, Immoral Fiber, Resonant Evil, etc. Allow players to react to challenging defense teams by building a counter team of their own. When you join a Prize Fight, first thing you'll need to do is set a defense team that other players will face. Build a team of three fighters that you think others will have a tough time defeating! Remember to consider the current Prize Fight's modifier to build the most challenging team. You can have one defense team for every available Prize Fight, so make sure to set a defense team for all of them! If you upgrade a node, level up, or equip a new blockbuster, the changes will also be automatically applied to any defense team that contains that character. No need to worry about constantly updating your defense team once you set it! Every time your Defense Team fights another player, you earn points - win or lose! A win will grant you 10% of the total FS of your team and the opponent's team, whereas a loss will earn you 1% - every little bit helps! Be sure to keep track of Fighters and team compositions that are often beating your team so you can fine tune your team for maximum performance! 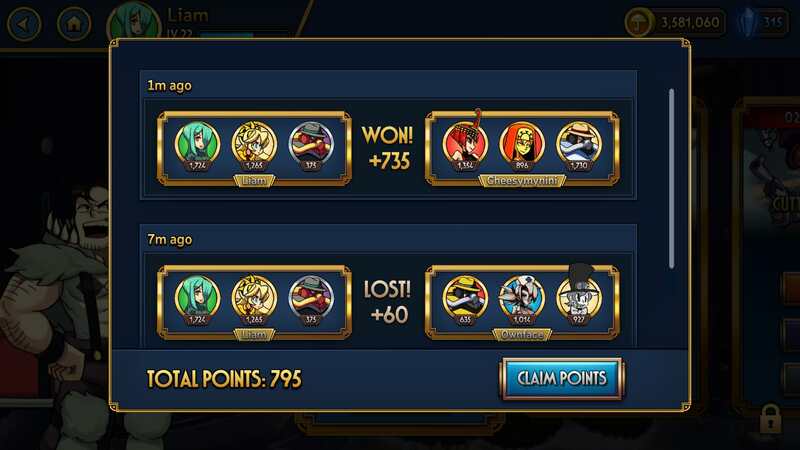 After your team is challenged 10 times, you won't be able to receive rewards for any fights until you claim your points. There is no notification for when your fight history is full, so make sure to check in often if you want to maximize your point gains! You now choose your team AFTER selecting your opponent. THIS is where "hard counter" Fighters will be especially useful. Know you're going up against Armed Forces or Resonant Evil? Bring Peacock Ultraviolent and/or Silent Kill! Going up against Princess Pride? Bring a Wulfsbane and block that healing! Because the teams you're fighting against are going to be a lot tougher this time around, we've added the ability to "Refresh" your opponents list for 30 Theonite. Despite all of these new tools at your disposal, you'll need to play your hand perfectly in order to survive at the highest streaks. Given that you now choose your opponent first, streaks and opponent selection have been reworked! Every streak level has a target fighter score range which is used for finding opponents. In a Gold Prize Fight, for example, streak 5 will always search for at team with ~5000 fighter score. Your own fighter score does not matter. The fighter score minimum range and maximum range is very lenient, so you shouldn't see triple Cerebella or Beowulf teams anymore unless you're very unlucky! Health and Attack boosting modifiers will be applied to opponent teams starting at streak 16. The HP% and ATK% boost will increase by 20% for each additional streak level after 16. Think you can take down a 300% HP and 300% ATK Dread Locks? Make sure to bring the right team! 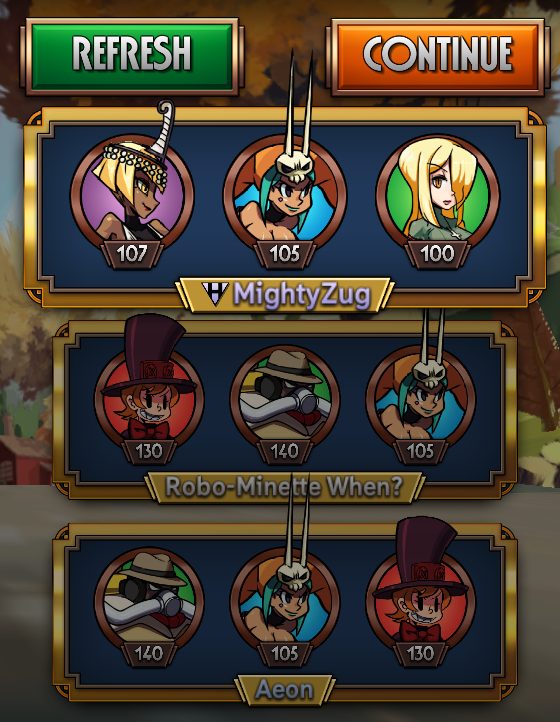 Added a unique text color for bot teams and HVS developer teams in Prize Fights. We understand that these changes are pretty substantial -- as always, we're eager for your feedback! You can now set a unique display name to use instead of the name that is assigned to you based on your login option. Good riddance, "shamefulgmailaccount"
Existing players will be prompted to set a unique display name when they first log into the game, and new users will be asked to set a unique display name after completing the tutorial. For those users who have already reserved a display name, this step will be unnecessary and your name will already be set for you. At the moment, there is no way to change your display name once it is set, but we will be implementing a name change feature in the future! You can use the Chat to talk to other players from around the world, and you can access it from most screens in the game. Discuss whatever you like with your fellow players! Gameplay, strategy, music, games, and of course the important stuff, like ... who is the best waifu? 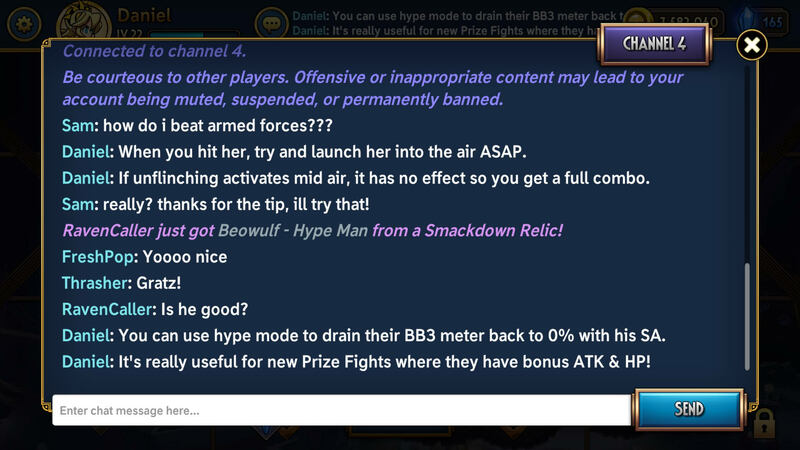 Keep in mind that there are CHAT RULES that you must follow. If you break these rules, your account may be subject to punishment. Depending on severity, you may be locked out of chat features or out your entire account temporarily or permanently. Be civil and respectful and you shouldn't encounter any issues. If you see anyone breaking chat rules, please remember to report them to reportabuse@hiddenvariable.com along with a screenshot of the offending text per the instructions from the chat rules thread. Players now received 25 Theonite on EVERY Player level up (instead of getting less early in the game and more in late game). All daily mission rewards have been reduced by 5 Theonite. You can now create a LINE account and use it to login to Skullgirls! Reworked the login screen again to make room for the LINE login button. The term "Skullgirls Login" is now synonymous with "Email Login" at various spots throughout the UI. Numerous UI changes were made to accommodate the new chat feature, far too many to list! Added voice actor information to the bottom left of the Character Details for both English and Japanese voices. Now you can confirm that suspicion in the back of your head: JP Big Band is Joseph Joestar! Added several new loading screen tips for Prize Fights, Chat, Defense Teams, Blockbusters, Blocking, Managing Meter, and Punishing. Tons of small localization fixes and text position improvements. Changed difficulty from Basic to Master. Brain Drain now introduces the mode and properly establishes that this mode is HARD. Star-Crossed Parasoul is not available in any Relic (FOR NOW), but you'll be able to find her as an AI opponent in Prize Fights, Story Mode, Daily Events, or any other mode that supports random characters. You can discuss her [HERE]! Fixed an issue where resisting the "Evil Presence" modifier at the start of the round would prevent the match from starting, while also freezing the timer at 3:00. Fixed an issue where "IMMUNITY" text was spammed onto the screen causing a brief hiccup if your fighter had the Immunity buff and specific circumstances were met. Fixed an issue where Invincibility would not properly block damage from Bleed. Fixed an issue where Hemofilia was not ticking for the correct amount of bleed damage against opponents with HP% increasing modifiers. Fixed Valentine's Character Ability not working correctly when a team consisted of multiple Valentines. Removed soft lock caused by canceling Double's Outtake into a BB before it completed. Sundae School Double's SA now properly extends debuffs inflicted by Red Velvet Eliza's SA2. Added extra logic to ensure that Painwheel's BB3 "Buer Overdrive" will always hit the opponent. Fixed an issue where using a BB3 after the opponent was dead would soft lock the game, cause a non-progression. Phew - you made it! Let us know what you think of our changes down below! We can't stress enough how important your feedback has been for shaping the future of Skullgirls, and you have all been amazing so far at sharing your thoughts with us! Keep an eye out for this update early next week! After the update of the App via PlayStore, the additional content stuck at the decompressing. I have to uninstall and reinstall the app in my Android. Now i have the last version ready to sink in PF! Hi Team Skullgirls. In this update I'm a little disappointed, because I'm heading to Prizefights and I fight with low nives, less than 1000 strength and my fighters are 6000 forces. I'm just gaining experience too low. No fights are equal to my fighters anymore and I do not want to use my level 1 fighters to start these fights either. My favorite fighters are of high levels and these fights only bore me and take time away. So I do not want to continue fighting, with levels that are not equal to mine. This seems to be Mortal Kombat, you have to raise levels of fights to get to the real action, but my fighters are very strong for these fights and I do not get experience that serves them in anything. I apologize for being rude but it is the reality of what is happening in Prizefights. What happened? you always bring great news, but today it has been the opposite in Prizefights. We have always chosen the fighters and then the game paired us with levels similar to ours, but today it is not like that, you must start from the lowest to get bored before reaching levels of fights similar to my fighters. With only three fights I did not want to continue fighting with levels too low for me. Neherenia and RMITB like this. I guess we are all experiencing tons of serious and minor bugs in this update with relics not showing or appearing anywhere else and much much more.My game also stuck in Fight Prize Mode after a win where I had to restart the app completely. Also a daily mission was just saying "Spotlight" without a description at all.It was completely blank! It also seems people are experiencing issues where their coins do not count when spent athough I cannot confirm that. This update needs a rework ASAP. There are so many things we are facing right now that a different thread should be made just for this purpose. For those users who have, this step will be unnecessary and your name will already be set for you. Keep in mind that there are that you must follow. If you break these rules, your account may be subject to punishment. Depending on severity, you may be locked out of chat features or out your entire account temporarily or permanently. Be civil and respectful and you shouldn't encounter any issues. If you see anyone breaking chat rules, please remember to report them to along with a screenshot of the offending text per the instructions from the chat rules thread. Star-Crossed Parasoul is not available in any Relic (FOR NOW), but you'll be able to find her as an AI opponent in Prize Fights, Story Mode, Daily Events, or any other mode that supports random characters. You can discuss her ! Dennis Aguilar and Zuzuska like this. This, exactly. It doesn't seem worth it unless you horde lower level gold/silver/bronze just for the sole purpose of grinding out those first few fights and even providing any kind of challenge to get to the worthwhile fights. What should I do with this problem? After winning a prize fight at the end of the battle the game just stop in this animation, I had to relaunch the game. Am I the only with this issue? que mal que ese chat no se pueda desactivar, es bastante molesto tener que ver conversaciones absurdas de niños como que se unan a un clan o que le van a pasar fotos de una amiga. Ojalá consideren la opción de desactivar el chat ya que no todos buscamos hacer amigos en los juegos y solo queremos jugar. Dennis Aguilar and Neherenia like this. Just started daily gold prize fight and had to fight 3 300 point fighters with a 3 5k+ fighters. Barely made 20k when I should be scoring 100k+! You have cut the rate to 50% on specific relics,cut currency rates every patch and generally done everything you can to screw your players over. If this is the way skullgirls plays now...... I'm done. I thought the developers taking over skullgirls was a good thing, but I miss Line running it....at least they didn't screw us over like this! I dunno... I mean, I'm pretty sure the idea behind starting out low early was to help spread variety of defensive teams. So that you could see fighting teams that you would've never seen unless you used strangely low fighters. It certainly does make things a bit tougher for players with few fighters to start out though. Instead of throwing out accusations and negative remarks, you could offer some opinions and try to change things in a productive way. This update has just been released, there are definitely going to be errors or disliked patches. Just remain calm and offer what you think could be a solution to the issue at hand. I'm absolutely sure the developer's goals are NOT to annoy or scare off players. PHPP, Synfull, Al Qedic and 1 other person like this. I get that, but fighter energy is a valuable resource, and so is available space for fighters. Unless you horde fighters to beat low level fights, you're wasting higher level fighters energy on low fights, wait till that renews, rinse and repeat, the get a streak high enough to be worth the time and effort, and I don't feel like sitting on my phone for ten hours playing the game just to get half way where it's worth it. It just feels like a much bigger grind fest than it was before. Defense teams help, because you get points win or lose, but still, it seems a bit overboard. Anyone else hating the new prize fights? it's ridiculous, when you loose a fight later on (i lost in streak 27) you get sent all the way down to fight 300 figther point characters again... it's super dumb, is that the new definition of fun? fighting fights that you cannot possibly lose and eiter waste your time or not play the game by activating the fighting AI? Did something happen to debuffs in this update? Because when I got up to about 20 in a row in the Prize Fight, I suddenly started to notice that Parasite Weave was having trouble stunning or bleeding people. Or maybe I've just gone crazy. But I thought I'd ask. Is the update for iOS delayed again? The game says it can be updated, but it isn’t appearing in the store. Nevermind, update was available now.